The Serious Guitarist: Essential Book of Gear is an invaluable source for everything you need to know about guitar equipment. 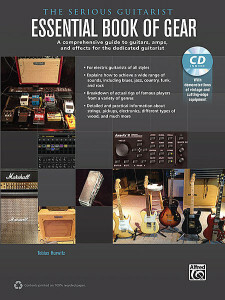 With tons of photographs and illustrations, real-world explanations on how to achieve signature tones in a variety of genres, helpful tips on gear maintenance, and an in-depth overview of the landmark innovations in guitars and guitar-related technology from the 1930s to the present, this comprehensive book provides all the tools you need to gain a rich understanding of the evolution of electric guitar gear. The Total Rock Guitarist is an exciting journey through the diverse world of rock guitar playing. This wide-ranging study of rock guitar is for all players from beginning to advanced. The beginning-to-intermediate player will find all the tools needed to become a great guitarist, while the more advanced player will find lots of useful tips and a fresh perspective on rock guitar. This book features many of the styles that make up the world of rock guitar: from classic rock, blues and funk to alternative and heavy metal. This is the one place to get everything you need to make you a great rock guitarist. A CD is included with backing tracks in different styles to jam over. Play Rock Guitar: Getting Started is a complete DVD and book package that teaches the basics of lead and rhythm rock guitar. After completing this course, you’ll be able to jam along with your favorite recordings, play live with a band and create your own unique sound. You’ll learn all about the Strat and Les Paul (the two most popular styles of rock guitar), and how to get the best tone from an amplifier. You’ll also learn useful musical concepts such as unisons, octaves, major scales and pentatonic scales, and the tools of the rhythm guitarist: eighth-note grooves, power chords and open chords. This DVD also covers lead guitar techniques like hammer-ons, pull-offs, trills, vibrato, bends and slides, and how to put everything together for a killer guitar solo. If you admire guitarists who combine killer technique with exciting musical ideas, the Serious Shred series is for you. Each title features lessons from renowned shredders and educators, and includes licks and examples in both standard notation and TAB—all combined in a book and DVD package for a complete learning experience. Learn what you need to know to become the best player possible, straight from bona fide shred virtuosos. Shred Boot Camp is the first book and CD package of its kind: A graphic novel that teaches you to shred on the guitar! As you follow the action through this five-week shred workout, you’ll be exposed to the most challenging licks of Michael Angelo Batio, Dave Martone, Tobias Hurwitz, Glenn Riley, Chris Ranier, and Curt Bell. It’s all herehyper hybrid picking, neck-spanning legato, wild sweep tapping, bizarre harmonics, and insane whammy antics. Witness the fastest speed picking ever recorded (19.5 notes per secondall picked)! Marvel at the mind-numbing alien modes and arpeggios contained within. Wow your friends with every imaginable power chord (and some that boggle the mind)! How do your favorite guitarists get their sounds? Learn the setup secrets of the masters and find your own great sound with this manual for serious guitarists. Read about guitars, amplifiers and effects units and how to make your own gear work its best. Each effect is covered in depth, and a special section details the setups of the masters, suggesting ways to recreate their sounds with basic effects available anywhere. A special section on the physics of sound is included. This is a must for every electric guitarist. A CD is available demonstrating all the guitars, amps, effects and master guitarists’ setups. Get ready to turn it up to “”11″” and go “”7.”” Learn the styles and sounds of the most impressive rock artists to ever use seven-string guitar. This book covers the characteristics of four of the most important tunings, with related chord forms, rhythm guitar riffs, scales and licks. You’ll learn the significance of each tuning and the reasons different artists use them. Plenty of usable riffs, licks, and solos emulating their styles are included. All music is written in both standard music notation and tablature. The CD contains all the music featured in the book. This is a must-have title for the modern rock guitarist who is always looking to go to that extra step. Philip Toshio Sudo, founder of the Zen Guitar movement, and guitarist and educator Tobias Hurwitz present this follow-up to the best-selling book Zen Guitar. Inside are musical examples that help bring the Zen philosophy to life on anyones guitar. Learning these ancient ideas can help guitarists become more “”in the moment”” in their musical approach. The Book of Six Strings helps guitarists break out of a creative rut and take playing to the next level. This book’s centerpiece is “”One Sound One Song,”” composed by Philip Toshio Sudo as a musical launching pad for Zen Guitar exploration. Included are inspirational quotes, philosophical concepts and historical facts mixed in with the musical examples. Also included is a CD demonstrating all of the examples in the book. This book is the ideal choice for those looking to be inspired and to deepen their spirituality and musical understanding. If you have ever heard a piece of guitar music and wish you could play it but were baffled when you tried to figure it out, Learn How to Transcribe for Guitar is for you. You’ll be able to choose any guitar tune and learn how to play it without books, magazines or help from a teacher! Transcribing rhythms, single-note lines and chords is explained along with music theory, ear training, alternate tunings, types of equipment and much more. A CD is included giving you practical transcribing experience. This book & CD features clear instruction on how to achieve the tones and effects of your favorite guitarists including an in-depth breakdown of effects pedals and processors, sample licks (in the style of Tom Morello, Joe Satriani, Stevie Ray Vaughan, Michael Angelo Batio, and others), ways to create unusual sounds, replicate sounds of other instruments, home studio basics, plus covers the various types of guitars, amps, speakers, and cabinets. The included CD demonstrates all of the examples and sounds. Upon completion of this book, youll be able to attain virtually any tone youre looking for (whether playing live or recording in a studio), simulate the sounds of famous guitarists past and present, and create a variety of special effects that will blow your audiences away. Great musical ideas need great chops to back them up. Build your finger strength, flexibility and independence with these exercise books from one of America’s leading guitar schools. Rock Chops deals with all the important soloing techniques, such as speed picking, sweeping, tapping, harmonics, scale sequencing and so on. Develop your chops practicing exercises in the style of music you enjoy! The CD includes the exercises.